Sometime in mid 2011, when the question came up on replacing my wife’s 3 year old i10 Kappa (which has done its service beautifully so far and will end its lease period in November), our discussion started going in all directions. My wife didn’t really want another hatchback as a replacement so even though we test drove the Figo, Swift, Micra etc, none of them had her excited. The Fluidic Verna was something that she liked, but I rejected it for its poor handling and soft suspension based on my test drive a few months back. The news of the Cedia price drop had her drooling over it, but given the gasoline engine and her every day usage, it wasn’t going to be an economical drive. So after going back and forth on the choices, she came up with an interesting proposal. She offered to make the Safari as her daily drive and then I could buy a car for myself. Initially, I tried to talk her out of the idea since the Safari is a pain to drive in the city, but given her willingness to tame the monster, the proposition looked like a win-win situation for both of us. So now the question was which car should I buy for myself? Personally, I’ve never been too fascinated of having fast cars that can do a quick ton on the speedo, or those which can transport you faster than the 200kmph mark. Neither the sleek sporty designs nor the classy status symbols entice me enough than when I look at an old school SUV or a Jeep. I always had my heart set on getting a 4WD jeep or gypsy so that I could join the off-roading events as another weekend activity to complement my love for photography. Given the nature of our expedition-like vacations, a jeep was indeed going to be a good addition, plus the soft top meant that I could remove it during the birding trips and have more flexibility to move around with my camera gear at the back which used to be a bit painful in the Safari. The downside of the idea was that with the Safari in the garage already, we’ll be fueling up two monsters, none of which would have good city manners. Moreover, we couldn’t really keep the i10 anymore coz three cars for a family of two was overkill, and I would run out of parking space too. So with all pros and cons weighed in, we were out in the market looking for our first off-roader. The first option was to explore the pre-owned route, that way I could even settle for a well maintained Gypsy and get it rally prepped for that one-time Raid-de-Himalaya experience (it’s on my bucket list). I tried a couple of times but could never close the deal because at the end of it, it seemed like it was going to cost me equal to a new one or even more. Building a MM550 was the other option that I had in mind, but the thought of the time investment needed for such a project kept me away from it. The other big requirement was reliability of the jeep since I may just use it for some of my crazy road trips as well which was not going to be a forte here. The last and final option was to buy a new Thar, albeit this was also the most expensive one. However, after giving it some serious thoughts and working on the CBA multiple times, I finally decided that the Thar it was going to be. It looked like a very decent overall package to start with and then build on that as the need arises. The key was the reliability factor which was the highest as compared to the above two options and the fact that a diesel motor would be easier on the pocket when I do try the long haul trips in it. 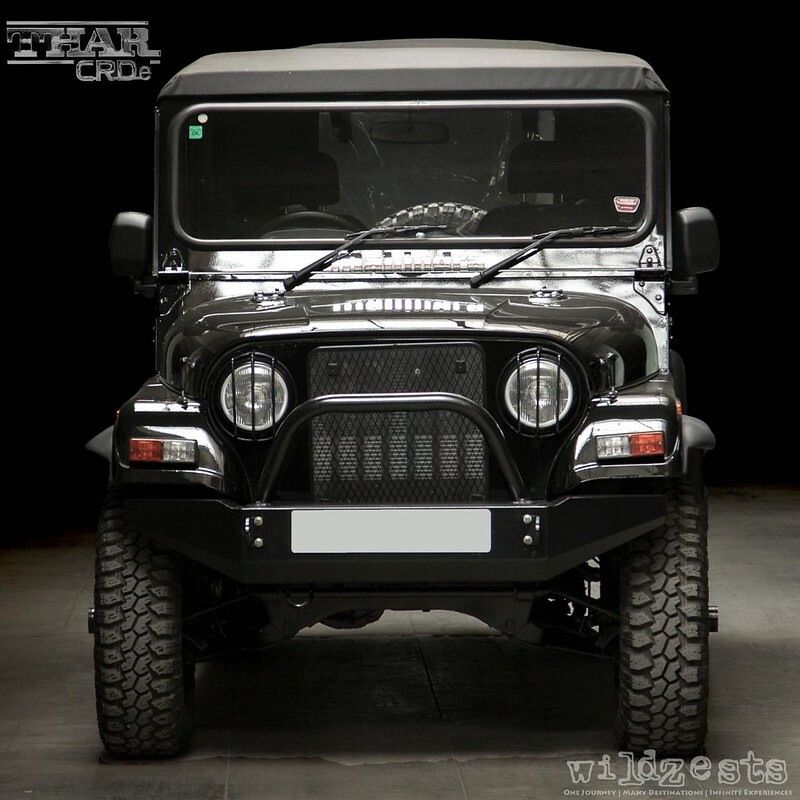 Having grown up with the company of my Dad’s Enfield and then owning one for over a decade, I can relate to the care and attention needed in owning a jeep. I always liked the fact that these machines were built to have a character rather than being mere transportation equipment. There has to be some kind of bonding that happens between the owner and vehicle as time progresses, otherwise there’s no thrill in life. Reading the ownership threads on TBHP, I could easily tell that this isn’t going to be a very easy phase of my life but it may still be the most enjoyable one. It took me a while, but I think I’m ready for it now, more than ever before. I’m ready for the pain, the angst, the sacrifices, more importantly to give it the love and affection it needs and all this for the simplistic joys of owning a jeep...Amen! card, medical health insurance etc. World travel visit researches assistance written by " international " service desk.